Writer/Director Paul Haggis based his upcoming film, CRASH , on a personal life experience in which he "was car-jacked at gunpoint" in Los Angeles, California. That experience inspired the screenplay for CRASH, which he co-wrote with Bobby Moresco. In the story, the lives of several racially diverse characters in Los Angeles collide with each other during a 36-hour time period before Christmas. Among the characters are a Brentwood housewife and her husband, a district attorney; a Persian store owner; two police detectives; an African-American TV director and his wife; a Mexican locksmith; two car-jackers; a rookie cop; and a Korean couple. At the heart of the story is a car-jacking. Actress Sandra Bullock plays the character, Jean Cabot, a Brentwood housewife who is a victim of the car-jacking. Bullock explains that Jean lives in a protected world. "[Jean is] an example of someone who has really built her life around things that are incredibly trivial and empty," she says. Bullock feels that people don't understand what the real world is like. "Our reality is so detached that I think it requires a catastrophic event to make us either feel or acknowledge what's actually going on," she adds. According to co-writer/producer Bobby Moresco, people don't always come in contact with each other in Los Angeles because they use cars for transportation. Producer Cathy Schulman agrees. "We protect ourselves in our cars It's highly simplistic, but surprisingly true," she says. The characters in CRASH deal with racial problems, and Haggis's co-writer, Bobby Moresco, defines racism as a societal problem. "I think that on some level everybody in America is touched by the question of race and racism," he says. 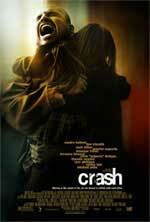 When CRASH debuts in movie theaters on May 6, 2005, audiences will see how racism has compromised our society.